EPW048667 ENGLAND (1935). Farmland near Kidsleypark Villa, Smalley, 1935. This image has been produced from a damaged negative. 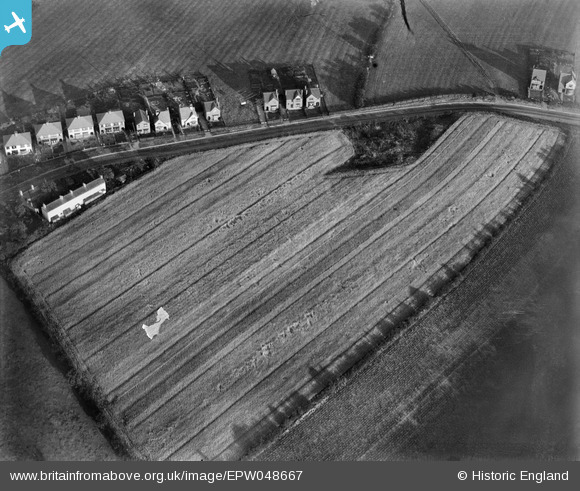 Title [EPW048667] Farmland near Kidsleypark Villa, Smalley, 1935. This image has been produced from a damaged negative. I think this pair of houses is visible in EPW048666, right at the top of the image. Wonder if these photos were taken as a precursor to the mining operations. Most of the field boundaries were put back the same. You may be interested to know that the original Aerofilms Ltd Register entry reads "Field at Derby Capt. W.H. Marshall". Maybe you can tie him to the firm that carried out the quarrying? Or did he own the land and sell it to the quarrying company? Either way, that entry reads more like a private client than corporate client. Would be interested if you can find out more! We'll update the catalogue and post the new data here in due course. I think EPW048664 EPW048665 EPW048666 (EPW048667) are of same area. This rural picture stands between pictures also taken in July 1935 of the Manchester and Sheffield areas, suggesting it is somewhere between the two. This could be narrowed down to it being on the edge of one or other of the built-up areas as most of the space between the to cities is taken up by the Peak District. While not offering a location, this picture does provide a clear image of pre-greenbelt Britain. 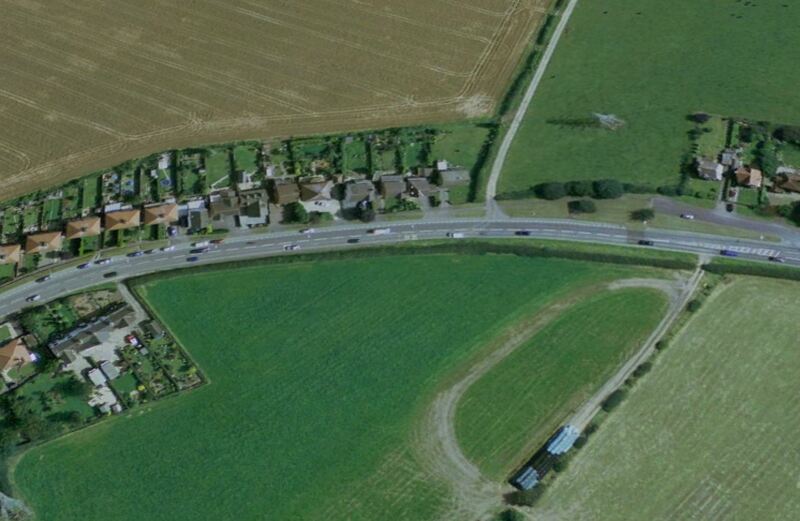 The line of semidetached and detached houses 'stranding' out along the (main) road suggests some uncontrolled development, with a farmer (land owner) taking the opportunity to sale of some accessible land. The gaps in the rows of houses often led to the development of side roads with further housing as the original 'ribbon development' was consolidated. There were many examples of ribbon developments along roads around towns and cities, which became one of the reasons for the introduction of green belts to control the extent of urban sprawl.